Editor’s Note: Two of the most important people in Mossy Oak, especially for Toxey Haas, Mossy Oak’s creator, were Toxey’s mom and dad, Evelyn and Fox Haas. Often people will ask me, “What part did Mr. Fox play in the early days of Mossy Oak?” My simple answer is that Mr. Fox always has been the moral compass of Mossy Oak - that wise voice to advise us what we need to do to grow the company in the right way. Mr. Fox always has stayed in the background. Mossy Oak has been Toxey’s dream, and Mr. Fox - then and today - is the loving, supporting father of a son with a great idea, who has wanted to see that son reach the full potential of his dream. Mr. Fox helped us get the original building where Mossy Oak first started. When Toxey first began running his Mossy Oak ads in state and regional publications, he had a 1-800 number that consumers could call to order Mossy Oak shirts and pants. That number was at his mom and dad’s home, because Toxey was still working at Bryan Foods in the daytime and trying to grow Mossy Oak on the weekends and at night. Mr. Fox loves to tell the story of starting up the stairs in his house, picking up that 800 number when it rang, and in his deep baritone voice answer, “Mossy Oak.” When the person on the other end of the line said, “Can I speak to someone in customer service?” Mr. Fox would reply, “Sure you can.” He’d put his hand over the speaker part of the phone and whisper, “Evelyn, it’s for you.” Mr. Fox was the voice for Mossy Oak, and Miz Evelyn was the customer-service department. The gentleman on the phone told Miz Evelyn that he wanted to order a suit of Mossy Oak, but he couldn’t find it in his size. When Miz Evelyn learned that the man was more than 7’ tall and weighed more than 200 pounds, she told him, “Well, it’ll take a little while to get that size, but we’ll have it and send it to you.” Miz Evelyn then sat down at her machine, sewed the clothes to the man’s specifications and sent them to him. Miz Evelyn also designed the first face mask that Mossy Oak had for sale. She and two other ladies made all the facemasks we sold that first year, until the demand for facemasks was larger than the ladies and Miz Evelyn could handle. 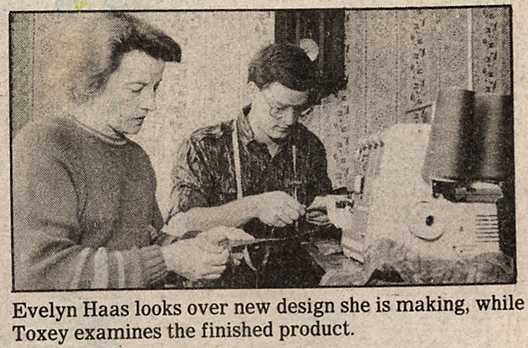 That same year we had someone start making our clothes. When the clothes came into our warehouse, they looked good, but we started getting some clothes returned that instead of being brown were purple. We learned that when that manufacturer made the clothes, he didn’t set the dye. He hadn’t heat-treated the garments, so the colors wouldn’t fade. So, we had a warehouse full of clothing that we knew as soon as our customers washed them, the colors would fade. We started taking all our clothes to the public laundromat after dark when no one was there. We’d cut all the tags off the clothes and put them into the dryers to heat-seal the colors and patterns, so they wouldn’t fade. Then we’d take the clothes out of the dryer, iron the clothes, put the tags back on the pants and shirts, fold them up and place them into bags for shipping. Miz Evelyn and her two ladies helped with this process also back in the early days. In those days, just everybody’s clothes faded because no one really knew how to set the dye to make the dye colorfast. Of course today, with better wet paper and better methods of wet printing and better dyes, making the clothes colorfast is simpler, easier and quicker than in those days. I learned a lot about Toxey in those days. Toxey not only was a great entrepreneur and visionary, but I think Toxey’s strongest characteristic was perseverance. Even before I was hired to work for Toxey, he’d been on the phone learning all he could about the clothing and the dyeing businesses, marketing in the outdoor industry and starting a business. Some words not in Toxey’s vocabulary then or now were, “giving up and quit.” The minimum order to print a pattern on fabric was much higher than what Toxey needed. Every time someone would tell Toxey that they wouldn’t print a small order of Mossy Oak, he’d call someone else. He kept working and calling until he found someone who would do a small print run to help him get started in business. A company seeing where it’s come from to determine the direction it needs to go is an important aspect of growth. Toxey Haas had an acorn of an idea about how to become invisible in the woods when he created Mossy Oak, and with that one idea he grew the company that’s far reaching into the outdoor industry with many branches off the trunk of the tree, deeper roots and taller trees that have spread. 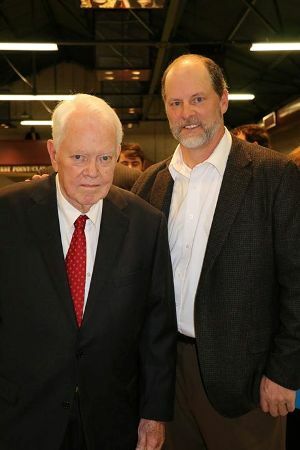 Fox Haas, a linchpin in the birth of multi-faceted outdoors industry icon Mossy Oak®, was inducted into the West Point, Miss., Hall of Fame on February 9, 2017. 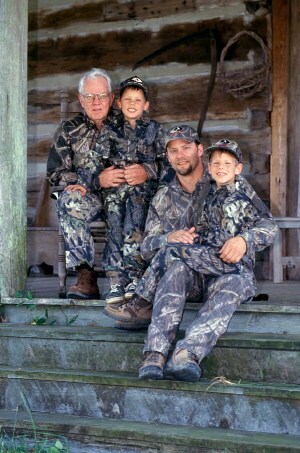 West Point is the home of Mossy Oak and Fox Haas’ residence for over 60 years. As long as I have lived, that video has been the most-embarrassing thing I ever have done. When we put the video together, Toxey reminded me, “We want to tell the whole story.” I knew he was right. I can honestly say that was the coolest hunt ever for me.